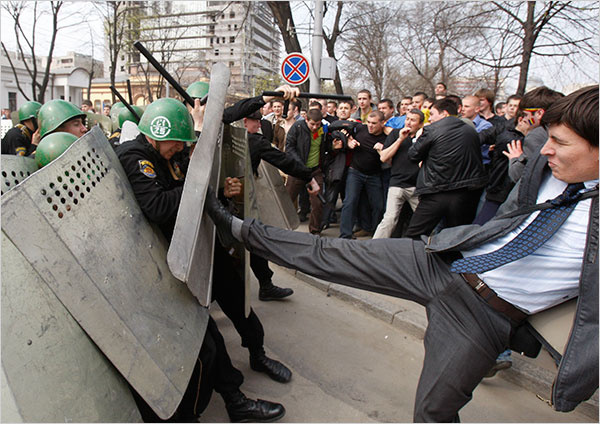 The Republic of Moldova will remember the days of April 5th to 7th 2009 as the dates when the fragile Moldovan democracy was put to a severe test by the violent conclusion of a tense electoral process. The devastation of the symbols of the official power, the Parliament and Presidential Palace, but especially the police's enraged reaction against the young protesters, political opponents, and the media not sympathising with the authorities has created a severe situation of tension in Moldovan society, tension that is threatening to further polarise and highlight the existing divisions. On April 7th, the police had seemed to react rather softly during the confrontations. Yet, as the violence of the protest, which ended up with over 200 policemen wounded, started to fade away in the night, they launched a forceful repression. The result was hundreds of people arrested. However, the worst was still to come in the police detention stations. Most of the arrested had nothing to do with the violent confrontations at the Parliament and the Presidential Palace, being either peaceful protesters or simple spectators - nonetheless, they were subjected to physical abuse. The latest figures presented by the opposition indicate at least 3 deceased, 3 missing, and 41 tortured young people as a result of the police repression. These numbers are the outcome of the investigations begun by the opposition mayor of Chişinău, Dorin Chirtoacă, and presented to the public opinion on April 22nd, hours before the visit to Moldova of Czech prime minister Mirek Topolanek, also representing the EU presidency. The authorities have so far acknowledged one death, though rejecting any hypotheses of police involvement and blaming a gas intoxication during confrontations. It is worth mentioning that the authorities' reaction to the events was at least problematic in terms of human rights, as even judges were called to police stations in order to sanction the arrested in the absence of their attorneys. Furthermore, the anti-governmental media started to spread rumors that young women had been subjected to sexual abuse while in detention. While these remain speculations, it is hard to imagine what actually happened, as many of the arrested were immediately transferred from Chişinău to local districts in order to hide them from the eyes of the anticommunist media. The international community unanimously condemned the violence, but related more ambiguously to the core of the events. During his visit, Mirek Topolanek pointed out political dialogue, the rule of law, and respect of human rights as elements that can bring stability to Moldovan society. Earlier, the EU High Representative for the Common Foreign and Security Policy, Xavier Solana, had focused on condemning violence and stressing the need for political dialogue. On the other hand, Russia declared immediate support to the communist government, recognising the results of the elections and backing the official version of attempted coup d'etat, though diplomatically avoiding to mention Romania. In the meanwhile, the OSCE monitoring mission issued a statement recognising the elections; however, the baroness Emma Nicholson, member of the European Parliament and the mission itself, questioned the accuracy of the report, regarded as too soft if compared with the reality. Also the US State Department pointed out the inadmissibility of torture and human rights violations, as well as the need for dialogue between the parties involved. Following pressures from the public opinion and the international community over the mistreatments, Moldovan president Vladimir Voronin announced an amnesty for all those involved, except the ones with a criminal past, thus trying to moderate criticisms. The vast majority of the arrested are currently being liberated; however, observers stress that, while most innocent young people are free, many politically and economically inconvenient ones, such as former Voronin's counselor Sergiu Mocanu and the millionaire Gabi Stati, are still being detained and charged with attempted coup d'etat. Such tension is enhanced as government-controlled media burst with similar accusations against the opposition. Thus, considering the restricted access to the remaining media not under governmental control, official propaganda is generating further hate and exacerbating - rather than calming - the spirits. As a whole, official propaganda has so far succeeded in creating a generally positive picture of the authorities' behaviour, especially outside the big cities, as the opposition press is still struggling to penetrate into the countryside. In an attempt to win credibility, Vladimir Voronin appealed to a recount of votes. The opposition refused to participate in this process, stating that the fraud was committed by manipulating the lists of voters and adding over 300,000 new names in respect to the 2007 elections. Therefore, lists should be re-checked in order to identify possible multiple voting and prove the fraud. While the recounting organised on April 15th generated the same result as the first one, the opposition is checking the lists of voters and has already denounced many illegalities. On April 22nd, however, acknowledging the results of the recounting and ignoring the opposition's request to have more days in order to check the lists, the Constitutional Court validated the elections, putting an end to the legal battles as the decision of the Court is definitive by law. If the legal procedures necessary to validate the elections have come to an end, the political situation is far from undisturbed. The newly elected Parliament must have its first session by May 5th and, after electing its ruling bodies, will have to face a major problem in electing the new President of the Republic of Moldova. The Party of Communists has 60 seats in the new Parliament, one vote away from the majority necessary to elect the President. Therefore, how they will try to obtain this vote is subject to speculations and even tensions, since failure to elect the President would result in new parliamentary elections.